10/17/2016 | TAKAUCHI Shugo: a master piece — dai ichi arts, Ltd. I always admire the Japanese artists who have chosen to refine their worldly life experience by quitting a safe, stable job to pursue an unpredictable but fulfilling artist's profession. Such a change takes enormous commitment and determination. There are many examples of artists who have made this change in recent ceramic history. KAWAKITA Handeishi 川喜田半泥子 (1878-1963) was a banker who loved pottery so much that he had a pottery studio and kiln in the backyard of his house. He began studying pottery at almost 60 years old. He eventually made between 30,000 and 50,000 pieces, mostly tea bowls, and never sold any of them in his life. He is now regarded as the Rosanjin of East Japan. MATSUI Kosei 松井康成(1927-2003) was a priest turned potter who eventually became a Living National Treasure. In our own potter's circle, NAKAMURA Takuo 中村卓夫 (1945- ) was a salary man before turning to pottery and HIGASHIDA Shigemasa東田茂正(1955- ) began his working life as a stock trader. So did TAKAUCHI Shugo (1937- ). While pursuing his business career in his birthplace of Tokyo, the train of Takauchi's life took a sharp turn after he visited the town of Mashiko and was stunned and inspired by the work of Mingei artist HAMADA Shoji 浜田庄司 (1894- 1978). He felt that he had found his life's calling, so he quit his salaried job in 1968, built himself a kiln, and began to teach himself pottery. Since then, he's had a tremendous career and has garnered a huge following among those who appreciate his Shino, Oribe, ash-glazed, and black creations. His work can be found in major museum collections throughout Japan, and he was awarded the Tochigi Prefectural Cultural Prize in 1998. 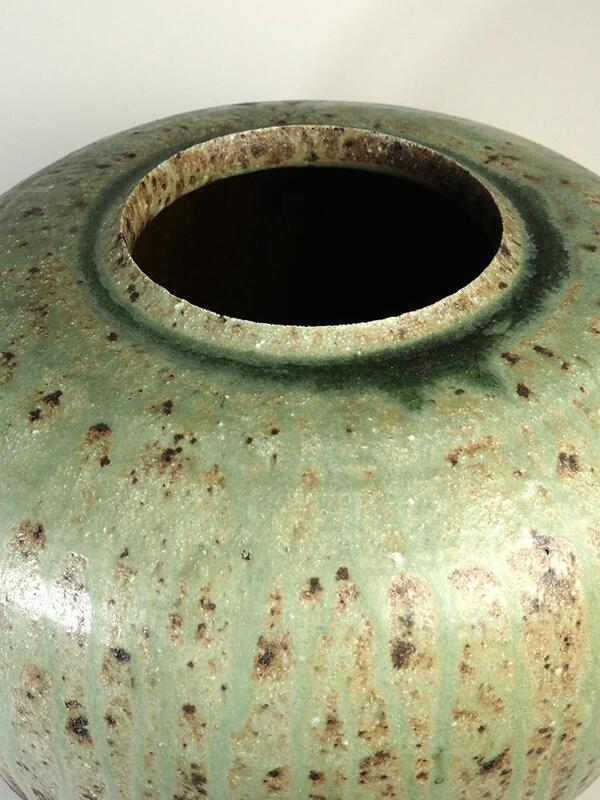 Here, Takauchi delights us with a strong, high-shouldered, globus ash-glazed jar. The green ash glaze pools at the top like water around the vessel's round mouth, and from there flows down the sides like the runoff from heavy rain. 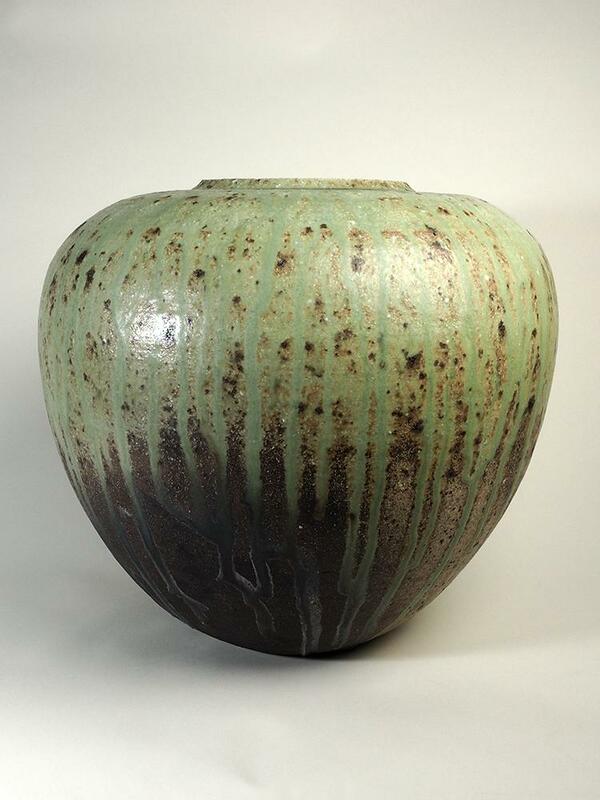 The movement of this massive ash deposit creates tension between the downward momentum of the glaze and the upward expansion of the jar's form. The overall feeling is one of natural tenderness. Like the big man himself, Shugo san shows us the great power of a beautiful ceramic!